Due to the light and screen difference, the item's color may be slightly different from the pictures. Size: 35mm~40mm. Color: As picture show. Material: Paper. Material: Paper Sticker. The actual color may be a little difference from the picture. Size:4.4 4.4 1.1cm. Composition: Korean. Material: PVC. Size: approx. 16 10cm (6 Sheets in each set). Quantity:1 Set (6 Sheets). Type: Adhesive clear glass tape. Color: As the pictures show. Material Paper. The actual color may be a little difference from the picture. 46 Pcs stickers. Warm Remind. Due to the light and screen difference, the item's color may be slightly different from the pictures. The product in the picture maybe larger than actual one. all our photos are made using light that is as close to natural as possible and avoid color variation. 46 Pcs stickers. Material: Paper. Color: As picture shows. we support wholesales. hope you could understand. Model Show. The actual color may be a little difference from the picture. Material: Paper. hope you could understand. Model Show. 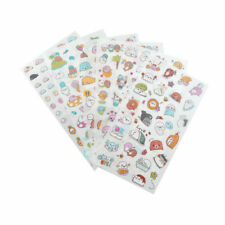 So cute 46 pieces kraft paper animals print stickers. 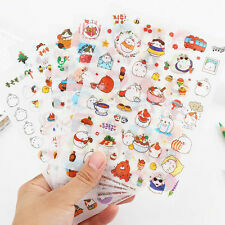 These stickers are made of kraft self-adhesive paper, The surface feels not smooth, the paper is not particularly thick, and it can fit your notebook well. Materials: PVC bubble puffy stickers. 2、The color may have different as the difference display,pls understand. Color: as picture show. The actual color may be a little difference from the picture. Size: 44 44 11mm. Size : Square size, 40mm 40mm. Material : Paper. Color: As picture show. Due to the light and screen difference, the item's color may be slightly different from the pictures. Round size, Dia 36mm. 45Pcs x Paper Sticker. Material: Adhesive Paper. It will be a good gift for your friend. Good way to decorate your album, photo,book. Color: As the picture shown. Due to the difference between different monitors, the picture may not reflect the actual color of the item.